We are all about game nights in our house, and love stumbling upon new games to try out during our weekly Friday night pizza, games and movie night. And, this past Friday, I had the opportunity to share "Game Night in a Can," which I was recently sent to review. I first heard about this game when it had a campaign on Kickstarter and was looking for funding. Then, life got crazy and I totally forgot to follow the progress of the game. I had hoped that it would get funded as it looked like a fun concept, and one that families would enjoy. 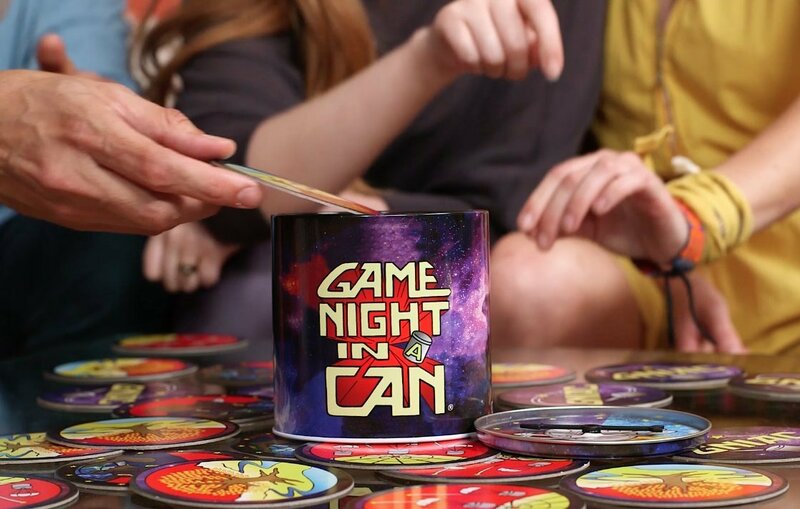 While searching for fun new games to try out and share in my holiday gift guide this year, I stumbled up on "Game Night in a Can," and remembered it. I was so happy to see that it got funded and that the game finally came to market. I was quick to contact the company and ask for a sample to be sent to try out. And, last week this fun family game, which comes in a small metal can arrived at our doorstep. I showed the girls the can and said that this had 30 different games in it, and that they would make our game night on Friday that much more magical and fun. The girls wondered what was inside the can and what types of games they would be playing. I told them they couldn't peak, and would have to to wait until Friday. "Just add paper, pens, and a handful of friends for the greatest game nights of your life... Gather your family, neighbors, students, or co-workers and let the fun begin with this unique, new game! Game Night in a Can gives you 30 original, creative games to make your next gathering a crazy, memorable time. You and your team might pitch a new commercial for an old couch, create mythical animals, rewrite a national anthem or competitively fly paper airplanes across the room. Fun game titles include Curate This!, Frumpy Bumpers, and Creepy Peepers. You can be the proud owner of a polished, uniquely-designed metal can that stands 4.5 inches tall (113mm in Canada!) with 30 high-quality cards inside. Each card has instructions for its own creative, fun game. 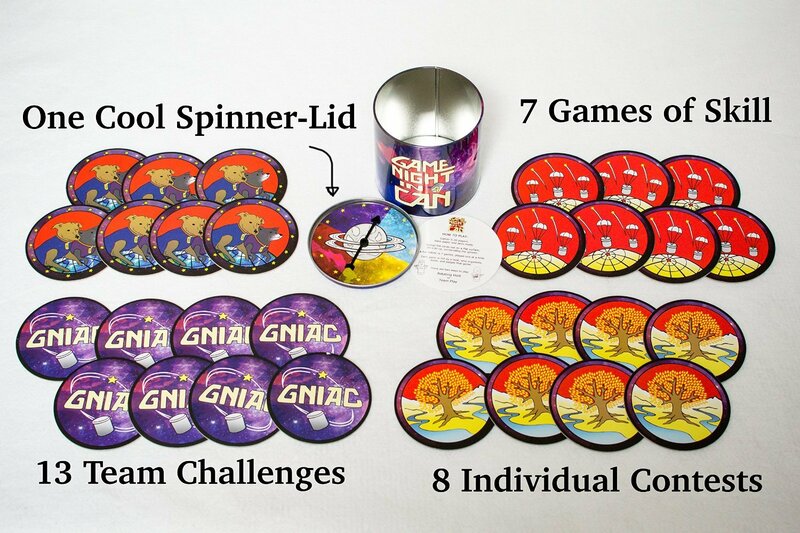 The greatest little secret about Game Night In A Can is that our unique spinner is located directly underneath the lid...this has never been done before in the history of spinner technology! There's no moving your pieces around a board here! With GNIAC, you'll find Creative Contests, Team Challenges, and Games of Skill. Since each fun night starts with 7 randomly pulled games, there are over 3 million variations of game nights you could possibly play. It's science... Improving your social skills is a given... but improving your brain?! Who knew a party game and a little friendly competition could do that?! With Game Night in a Can you get a funny, creative party game that will spark your imagination and activate the right and left sides of your brain, improving your brain's neuro-plasticity and problem-solving skills. See how unleashing creativity can reveal surprising new sides of friends, family, and yourself. Also, help the environment, because we plant a tree for every can sold! And our cans are made from recycled metal, with recycled cardboard cards and soy ink! Why wait?! Order Game Night in a Can today! It's the PERFECT GIFT for your family and your creative friends. Just spread out the cards and flick the spinner (conveniently located under the lid! ), whomever it points to is the first host. They pick a card and if it's a creative game, they're the judge. Games include creating brand new animal species for Noah's Ark, competitively flying paper airplanes, drawing cats getting into trouble and so much more." Doesn't this sound like a fun?! I especially love how each and every time you pull this game from the shelf it is a new gaming experience each and every time...so it never gets boring. And, I find with games like this, the more players you have around the table, the more fun it is. We had 9 people at our table the other night and after spreading out the cards and explaining the game to everyone, we were ready to have a fun night. I could go on and on writing about how much fun Game Night in a Can is, and how it would make for a great gift idea this holiday season for your family, to give to a child who is college so that they can play in their dorm with their friends, donate to a school, church or community group, or give that hard to shop for person in your life. 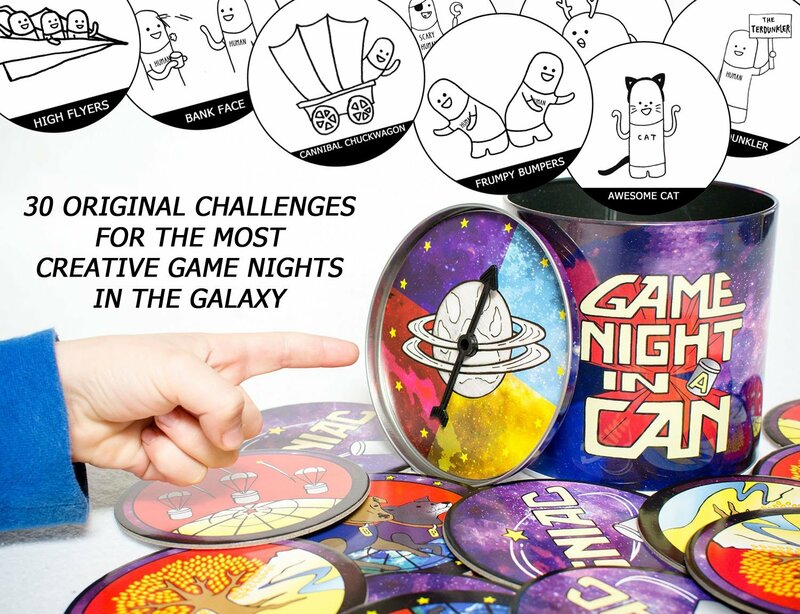 However you decide to gift this game night in a can, you will be sure that whoever sits down to play will have a blast, and will be laughing, smiling and not wanting to stop. We could have played these fun games all night now, if people didn't have to head home. But, I have already said I would bring it to my parents on Christmas day as they will be hosting dinner, and I will provide the games. :-) I can't wait to see what new versions of the games were played this past Friday, we will experience at Christmas time. 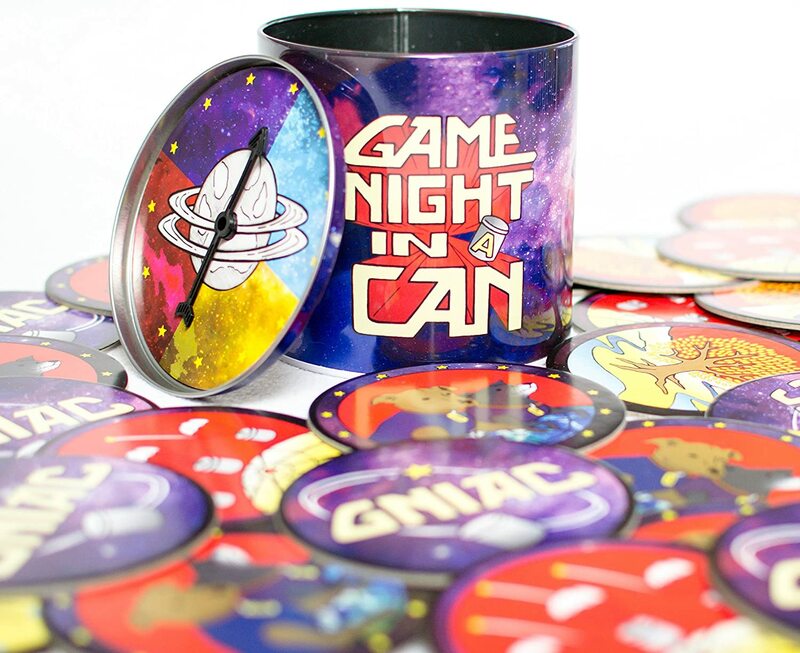 To learn more about Game Night in a Can, which you can purchase now at Amazon for only $24.99, visit the official game site here: http://www.gamenightinacan.com/.